According to the American Automobile Association, drowsy driving caused about 7% of all car crashes, 13% of automobile accident hospitalizations, and 21% of all fatal crashes. When drivers get on the roadways without adequate rest and sleep, they place themselves and everyone else in their vicinity at risk of severe harm. 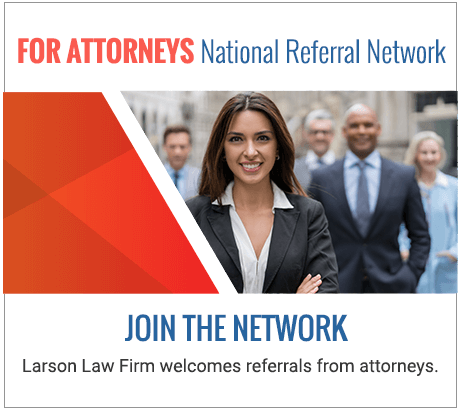 The seasoned North Dakota car accident attorneys of the Larson Law Firm P.C. fight for your rights by seeking compensation from drowsy drivers for the pain and injuries they cause. Drowsy drivers are not able to focus as much attention on the roadway and any potential hazards ahead of them. Delayed reaction time. If the driver suddenly needs to brake or steer, it will likely take longer to execute these actions. Lack of sleep is linked with an inability to make good decisions. Increased likelihood of falling asleep. Drowsy or fatigued drivers are more likely to fall asleep at the wheel, increasing the likelihood that the driver will crash into another driver or a fixed object. Drowsy or fatigued driving can contribute to very serious accidents. Such accidents may result in the need for ongoing medical treatment and significant periods of time off of work. If you have suffered such economic damages, speak to an experienced lawyer to find out about the legal options available to you. Through formal and informal discovery methods, our knowledgeable attorneys thoroughly investigate the factors that led up to the accident. This assessment helps pinpoint the underlying causes of the accident and establishes liability. In personal injury cases, the defendant’s conduct is weighed against what a reasonable person would have done under similar circumstances. Jurors and insurance adjusters can consider what they would have done in the same situation and will likely conclude that they would have opted not to drive in order to avoid a preventable car accident. This careful analysis strengthens your legal case and places you in a better position to negotiate a fair settlement. If you or a loved one was injured in an accident caused by a drowsy driver, we can help you recover compensation for the injuries you sustained. Contact the Larson Law Firm P.C via our contact form or call 701-484-HURT to schedule a free case evaluation. From our office location in Minot, we also serve personal injury victims from Ward, Williams, McKenzie, Pierce and Mountrail Counties.